Boy, have I ever got a bowl of crazy comfort for you today. I don’t know about you, but I am STILL recovering from the Thanksgiving festivities last week. We hosted about 14 people this year, and while I had a ton of help, I’m still feeling the effects of all the food prep, house cleaning, cooking, and hosting duties. I love it all (except maybe the cleaning, hah), so it’s definitely not a complaint! But it does take a toll on me, both physically and mentally. As a result, we spent much of this past weekend being completely useless. I did a lot of couch potato-ing and not much cooking. On Sunday, I finally managed to get myself back into the kitchen to make potato pancakes and eggs for breakfast (re-purposed leftover mashed potatoes for that one!) and turkey noodle soup for lunch and dinner. It felt good to get back into the kitchen after a few days of recuperation from the holiday cooking chaos. Whenever I get run down in the kitchen (or in life, in general! ), I crave soup. Hence, the turkey noodle soup this past weekend (also, everyone in my house is battling colds, so it was necessary). It is my ultimate comfort food, and I can say that I am almost ALWAYS down for soup. Today’s recipe is definitely no exception. 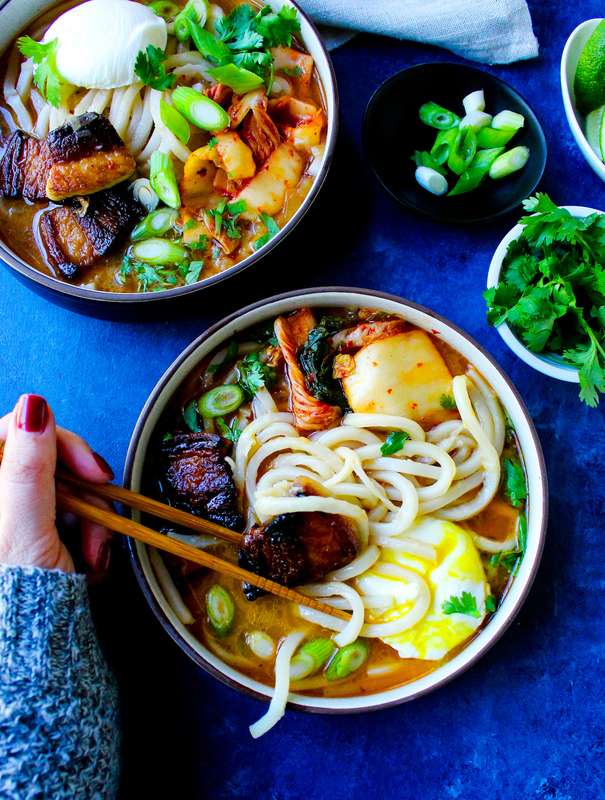 You guys, this udon noodle soup is both a flavor- AND comfort-packed meal. Let’s talk pork belly. It’s like bacon, except it’s not smoked and is great for slow braising. 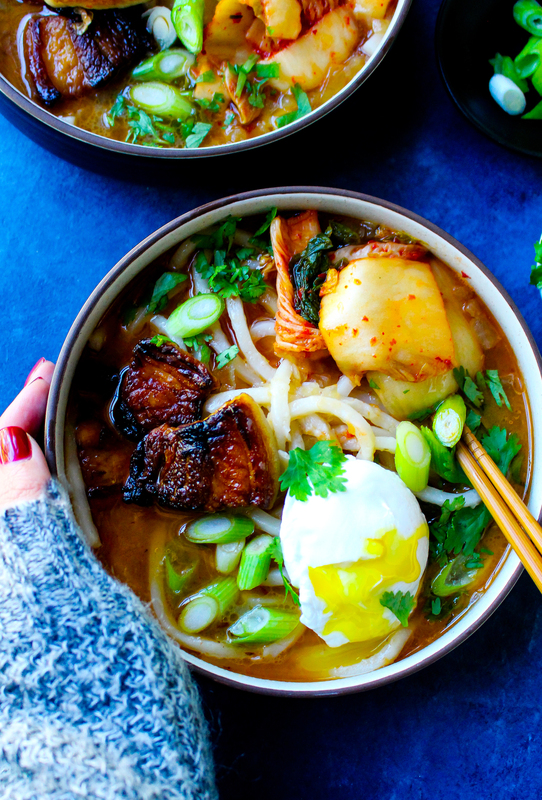 I got my hands on some and knew almost immediately that I wanted to do some sort of braised/crispy pork belly soup. With some kick! That’s basically how this soup came together. It all started with the pork. As do all good things in life, right? The pork belly gets marinated in a spicy chile sauce and then is crisped up to perfection. Much like bacon! But better! It has such a special texture: kind of crispy but still really porky and tender. I know some of you might be thinking “but I love my bacon crisped to the max!” and I totally agree! This is not like eating flabby, chewy, under-crisped bacon. It’s more like eating an extra-fatty (flavorful!) piece of pork with the most addictingly crispy outer layer. 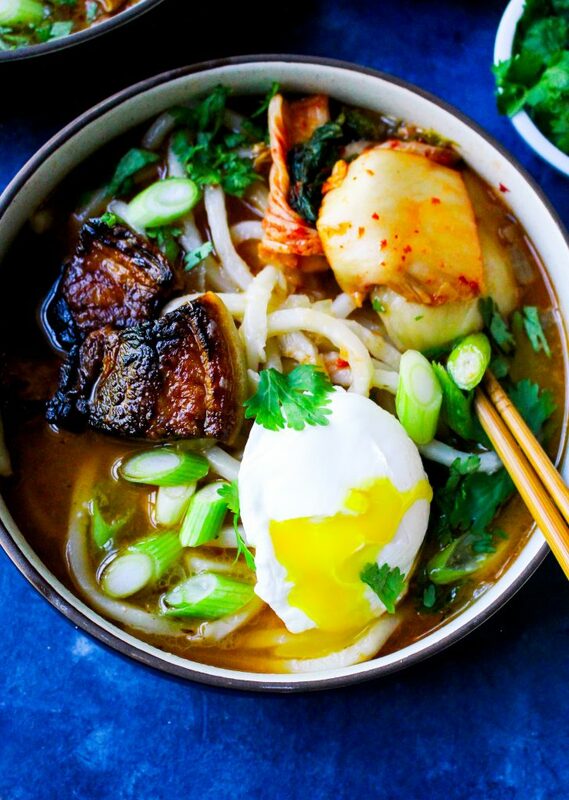 The broth is spiced with all sorts of Asian flavors and finished off with salty, briny kimchi. Also known as one of my newest favorite condiments. I am a huge fan of anything brined or fermented or pickled, and kimchi falls right in line with those things. It’s deliciously tangy and spicy and has a wonderful texture. Man, texture just seems to be the name of the game today, huh? Well. I’m not done talking about it just yet. Let’s get to the noodles. Udon noodles just might be my favorite noodle of all time. They’re slightly chewy and completely slurpable, which makes them ideal for brothy soups. I used them here for all those reasons. They are perfect for soaking up the spicy and porky broth and they have just the BEST…wait for it….TEXTURE. 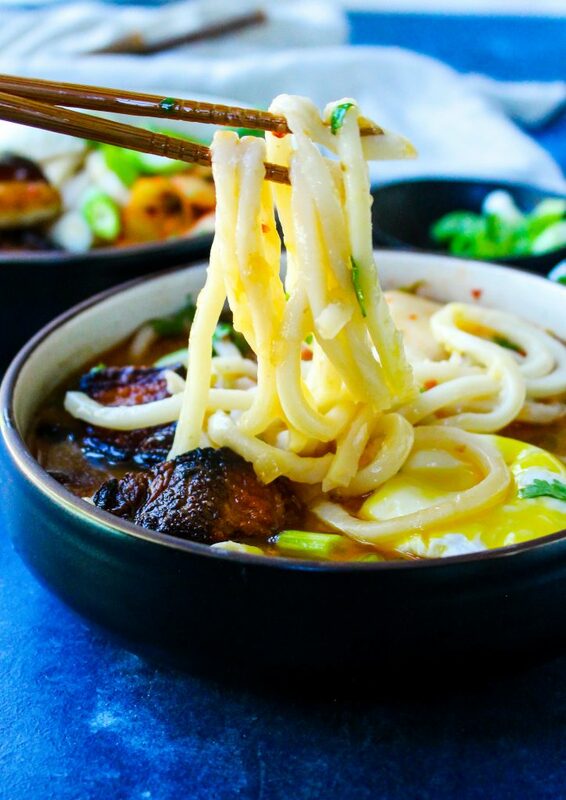 And you know a bowl of slurpy, comforting noodles wouldn’t be complete without a buttery egg yolk coating each noodle strand, right? Right. At least in my world. Eggs reign supreme! So, naturally, I added a poached egg to my bowl of udon soup and my life was complete. I have totally talked myself back into the kitchen with this post today. No more post-hosting-Thanksgiving kitchen doldrums here! 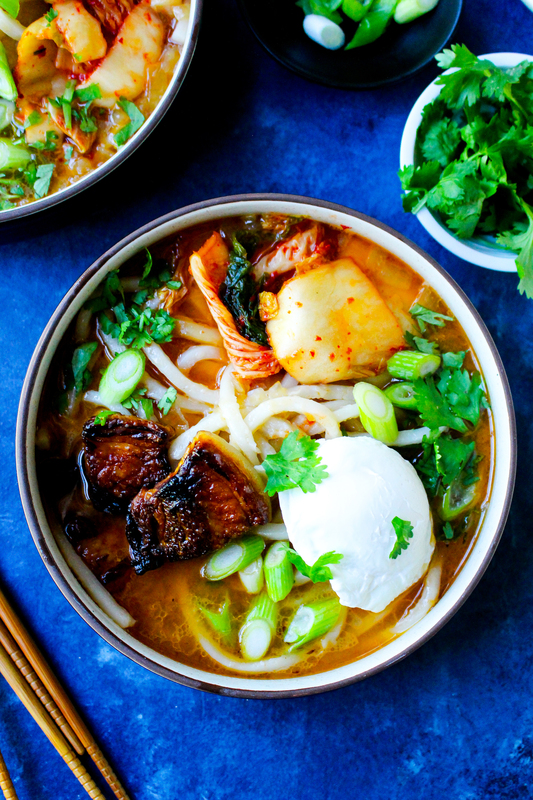 I think pork belly udon soup is on the menu for dinner! In a medium bowl, whisk together the garlic, ginger, chili paste, honey, soy sauce, and sesame oil. Add the diced pork belly and stir to coat. Marinate at room temperature for a minimum of 20 minutes or up to an hour. Heat a large pot over medium-high heat and add the pork belly and its marinade. 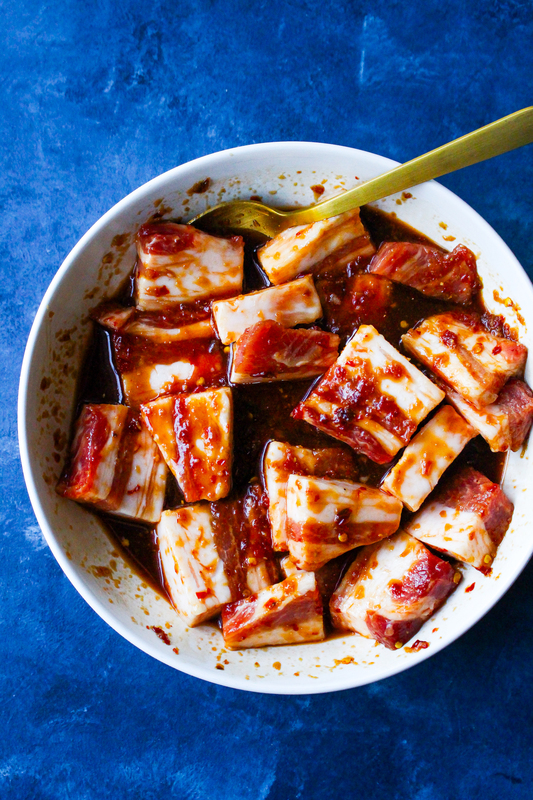 Cook, stirring frequently, until the marinade turns into a glaze and the pork is crispy. Remove the pork with slotted spoon and set aside. To the same pot, add the onion, chili paste, honey, and a small pinch of salt. Cook for another few minutes and then stream in the chicken broth. Bring the mixture to a boil and then reduce the heat to a simmer. Stir in the coconut milk and lime juice. Cook for another 15 minutes, stirring occasionally. Season, to taste, with salt and pepper. If you like things extra spicy, add another spoonful of chili paste to the pot. Meanwhile, bring a pot of water to a boil. Poach your eggs to desired doneness. Do not drain the boiling water. To the same water, add the udon noodles and cook for about 1 minute (or according to the package directions). Drain the noodles well and rinse them under cool water. 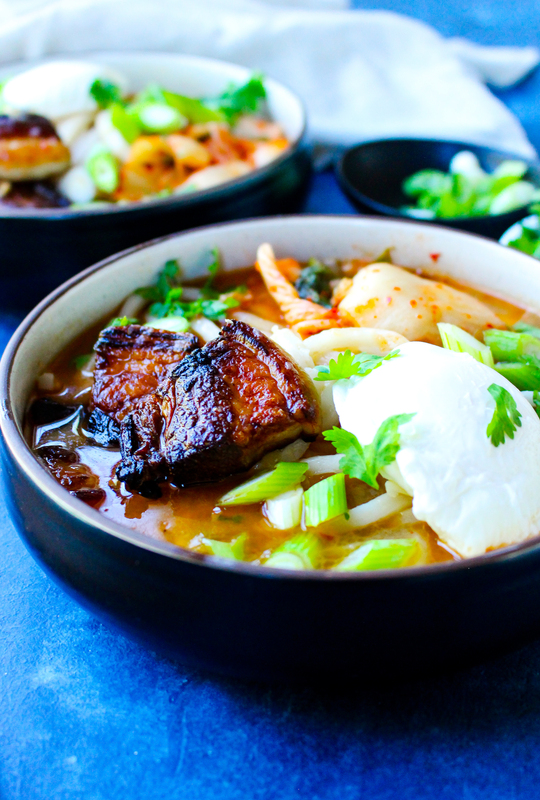 Fill each bowl with the udon noodles and then top with some of the crisped pork belly. Ladle the broth over top. 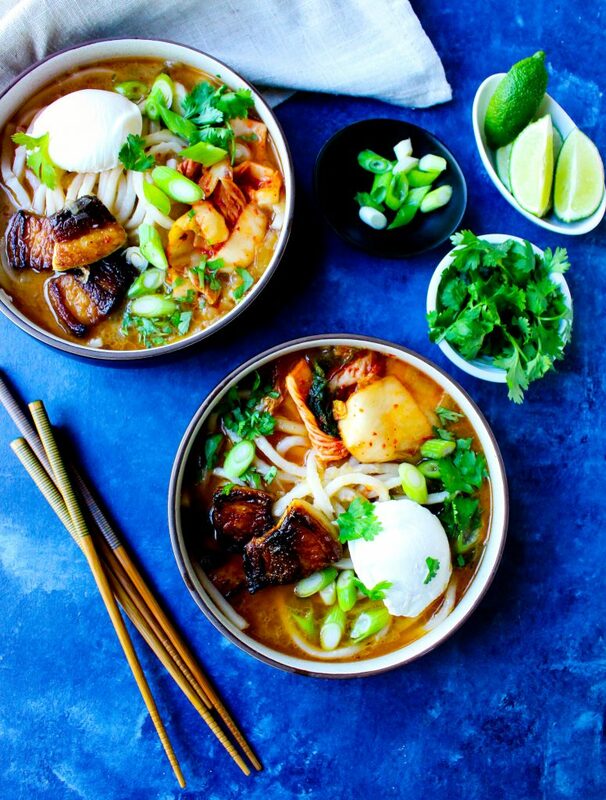 Garnish each bowl with some kimchi, the poached eggs, fresh herbs, and a spritz of fresh lime juice. If a spicier soup is preferred, feel free to add in some of the gochujang chili paste as a garnish. Serve immediately. A definite thumbs up from both of us! Was looking for a recipe for some pork shoulder I had on the freezer, so that’s what I used instead of pork belly, but I can’t wait to try it again with that. The coconut milk and like juice list the spiciness of the gochujang quite nicely. This one’s going on the keeper file. Thanks! Awesome! So glad to hear you guys enjoyed it! Just curious if the pork should have its skin on or off can’t wait to try it ?! I would do skin off. I hope you love it!